There are many holiday foods that you should never give your dog or cat. Green beans themselves aren’t the problem here. In fact, green beans are actually a healthy treat for pets. However, green bean casserole is often filled with other ingredients that can make your pet sick, like fried onion topping and mushroom soup. Cake batter and bread dough usually contain ingredients that make them rise, and if your cat or dog eats them raw, the dough or batter can actually rise in their stomach! This can lead to abdominal bloating and vomiting. It is also important to note that these things also often contain raw eggs, which could put your pet at risk for salmonella. Cinnamon and nutmeg are delicious additions during the holidays, but these spices can be very bad for pets. Nutmeg contains myristicin, which is a toxin that, in large amounts, can cause seizures and other issues with the central nervous system. Cinnamon can cause liver disease, diarrhea, vomiting and low blood sugar. 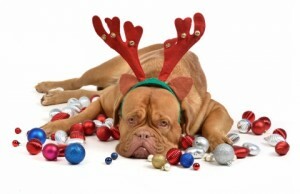 Although we’ve gone over several holiday foods to avoid giving your pets, we haven’t covered them all. When in doubt, don’t give it to your pet! Contact us today if you have any questions or concerns.